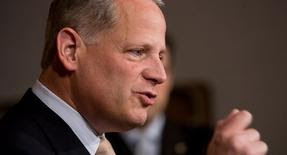 "The Lid": Why Does Steve Israel (D-NY) Accept Campaign Donations From a Man Convicted of Selling Arms to Iran ? Why Does Steve Israel (D-NY) Accept Campaign Donations From a Man Convicted of Selling Arms to Iran ? You can tell much about a politician from the donations they accept. My Congressman Steve Israel, who is also Chairman of the Democratic Congressional Campaign Committee, accepts money from at least one donor who should make people wonder about the Congressman’s sense of morality and his support of the nation of Israel. The donor’s name is Parviz Lavi and according to campaign finance reports filed with the Federal Election Commission (FEC), Rep. Steve Israel (D-N.Y.) has taken $6,500 from Parviz Lavi since 2006. Certainly nothing wrong with taking donations within the legal limit for the fact that In March 1998, Parviz Lavi was arrested by federal agents (and pled guilty) for conspiring to illegally smuggle fighter jet engines and their parts to Iran (yes that is the same Iran that wants to blow Israel to smithereens). “The Iranian-born owner of a Hicksville firm was arrested by federal agents yesterday on charges of conspiring to illegally smuggle fighter jet engines and their parts into Iran, according to officials. Parviz Lavi, 62, the owner of Omega Turbine Corp., 150 Express St., had been under investigation since 1991 by customs agents in Norfolk, Va., for a scheme to smuggle at least six turbine engines for the F-14 jet fighter and thousands of engine parts, according to Assistant U.S. Attorney Burton Ryan. According to court papers, Lavi had been wiretapped since 1992 discussing various schemes to sell the F-14 engines and their parts to Iran by shipping them first to associates in Rotterdam, Holland. At one point Lavi discussed paying between $125,000 and $150,000 for six of the TF-30 jet engines, the court papers said. “Mr. Lavi went to Norfolk several times with a shopping list of prohibited parts, officials said. Undercover agents from the Naval Criminal Investigative Service and businessmen involved in the arms trade who were cooperating with the Government agreed to sell him what he wanted: 500 metal vanes, or blades, for the powerful TF-30 engines on the F-14’s that were made to stringent specifications by Pratt & Whitney, a unit of United Technologies, in North Haven, Conn.
“According to an April 2, 1998, Virginian-Pilot article, “A former employee of the alleged mastermind of a plot to smuggle F-14 jet parts to Iran pleaded guilty in federal court Wednesday to helping negotiate the purchase and sale of the parts. In his plea agreement, Tony Zar agreed to testify against his old friend, Parviz Lavi - charged with heading a conspiracy to purchase and ship the American-built parts - and others allegedly involved in the scheme. Congressman Israel claims to be a huge supporter of the State of Israel and other Jewish causes. His deeds however, do not back up his words. While he has signed letters with other Congressman, not once has he stood up publicly to President Obama to criticize the administration’s anti-Israel policies. When the President was trying to legitimize the anti-Israel group J Street, Steve Israel obeyed orders and lent his name to the organization so they could recruit more people to its convention. Now we learn that Congressman Israel is taking campaign donations from a man who was convicted of selling arms to a terrorist-supporting regime whose goal is to destroy the Jewish State. It’s time for Mr. Israel to get his partisan head out of his arse and decide what side he is on. Does he support terrorist states and the anti-Israel policies of Barack Obama, or does he support the right of the Jewish State of Israel to exist in peace? His words say one thing, but his actions say another. Wait wait I know! Pick me! Pick me! It's because Steve Israel is a Democrat and so is void of morality!